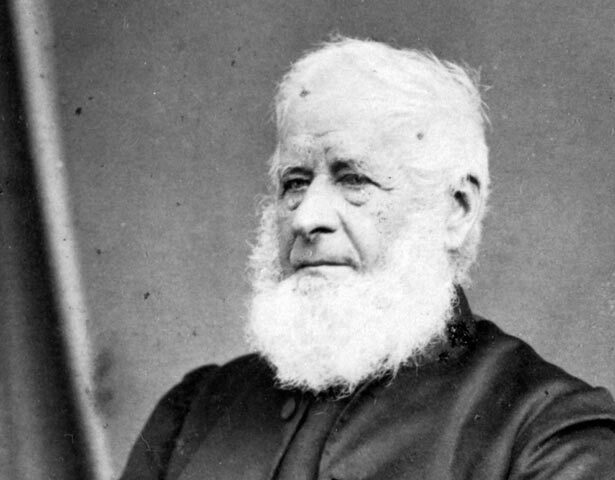 William Williams was an early missionary and linguist who later criticised the government’s policy of land confiscation during the New Zealand Wars. William was brought up in Nottingham in a family of Dissenters (nonconformist Protestants) but from an early age came under the influence of his brother-in-law, Edward Garrard Marsh, an evangelical Anglican clergyman. Marsh interested Henry, one of William’s older brothers, in the work of the Church Missionary Society (CMS), which in turn affected William. After a surgical apprenticeship, William underwent training at the CMS’s college in 1825. From the outset there was a tacit agreement with the CMS that he would follow Henry to New Zealand. William and his new wife joined Henry at the CMS mission station at Paihia, Bay of Islands, in 1826. At Paihia William Williams was in charge of the English boys’ school and for a time the mission doctor. His fluency in spoken Māori was soon noted by Henry Williams. In 1826 he began the first serious, sustained effort to produce the Scriptures in Māori. By the end of 1837 he had completed the whole of the New Testament and most of the Book of Common Prayer. In the 1830s William made a number of missionary journeys overland to Waikato and by schooner to the East Coast. Apart from a visit to England in 1851–52, William remained based at the mission station at Tūranga (the area of present-day Gisborne) from 1840 to 1865. For many years the only ordained CMS missionary in the church’s eastern district, he walked north to East Cape, south to Hawke’s Bay and inland to Waikaremoana as part of a regular visiting schedule. In 1859 he was installed as bishop of the predominantly Māori diocese of Waiapu. We have 31 biographies, 16 articles, related to William Williams.